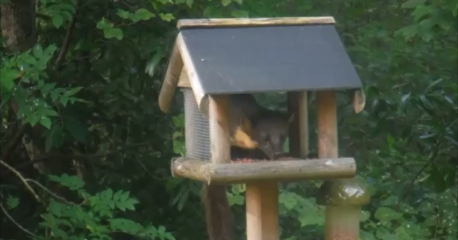 We got another really good look at our Marten yesterday. Again it was R who just happened to glance out of the window mid afternoon and notice him perched on the bird table. We’ve actually noticed a load of extra bird activity in the last week or so after several months where they haven’t seemed that interested in the food we put out. So while the Marten was busily crunching away on the nuts, the little birds were flying in and equally quickly flying away again when they saw him. From time to time he glanced at them as though he was considering adding a non-vegetarian component to his meal – but in general he just concentrated on stuffing down as many nuts as possible in as short a period of time. We got a great look at his formidable clawed paws and white teeth…. Then after about three minutes Schrodi suddenly appeared along the fence and our marten shot off into the bushes – briefly pursued by the cat. It actually puts the cats in a new light when you see that a large wild creature like a pine marten is scared of them rather than vice versa.